SYKETTÄ goes Christmas on Monday 10.12. SYKETTÄ goes Christmas – What, where, when? The Christmas is approaching and the autumn season is ending. Great reason to do some exercising together and enjoy Christmas sweets! 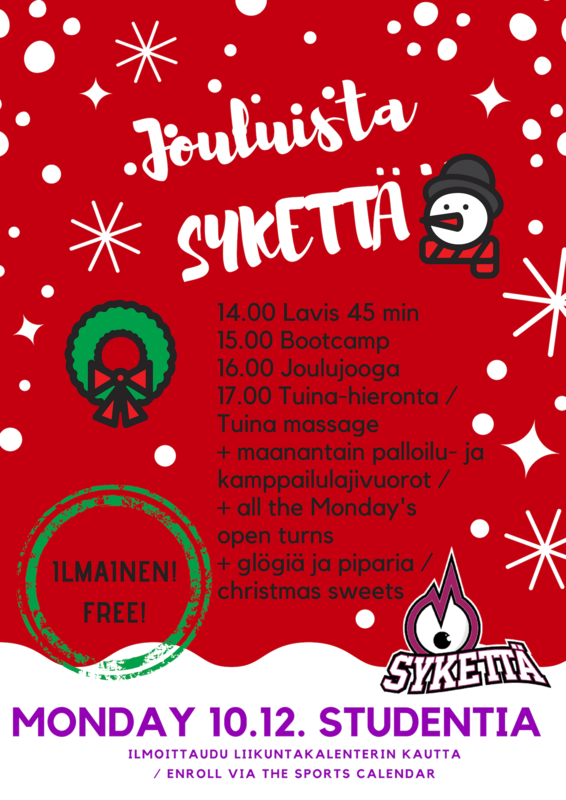 SYKETTÄ Kuopio invites you to our free christmas event, SYKETTÄ goes Christmas. It is open for all the members of the university community of Kuopio and you do not need SYKETTÄ sticker to participate. It is completely free! Just register to our site, if you haven’t done it earlier, and enroll for the Monday’s classes. 14.00 Lavis – Lavis is based on balancing with “open air dancing” and more traditional aerobic -exercise. Fun and sweaty! Mulled wine and gingerbreads offered in the Studentia between 14 and 16, yummy! We will raffle one free spring’s group class sticker between the participants of the Christmas classes!